Slessor: How can Scottish Labour make a difference out of Government? I don’t know about you but this independence malarkey is a complete distraction to governing Scotland. Every time I pick up the paper or listen to the radio all I hear is yes to Indy will solve this or that. But what about the problems we have now that the Scottish Government should be dealing with but is choosing to ignore. Although Labour is not in power at Westminster or Holyrood we still have a significant representation with local authorities. Therefore instead of just focusing on Indy; what can we do as a party to pursue our social objectives and make a real difference? One such social objective is the living wage. Scottish Labour authorities have taken great steps to promoting the living wage and ensuring that directly employed staff is paid as a minimum the living wage. However these local authorities have far greater opportunities available to them to influence the private sector in adopting the living wage. Well if it is that easy how do they do it I can hear the dissenters cry? Well the means to do this is through public sector procurement. Taking this forward, If it is this simple then why has this not been considered before? Well the main reason is money or more accurately the lack of it. A Council Tax freeze and more jiggery pokery than you can shake a stick at from John Swinney has meant that Local Authority budgets have been under pressure for the last 5 years and show no signs of improving. This is where the reader needs to expand their imagination somewhat and consider what the lowest cost is. All councils have an obligation to achieve Value for Money (VFM). The difficulty is most local Authorities actually see VFM as lowest tendered cost; but consider this radical thought. What if we took social considerations into assessing tenders; would we still define VFM still as lowest tendered cost? This is where local authorities could make a real difference, if we changed our views on what is VFM. Now let us say for arguments sake that all local authorities insisted that every employee of any supplier or contractor working for the authority must pay their staff the living wage. The first query would be yes that’s all good and well, but it will push up the cost to the Authority. Well I would argue that the private sector is such a competitive market at the moment they would be able to swallow this up with increased efficiencies. Job losses amongst suppliers to me would seem unlikely because these companies are likely to have reduced their staff to the minimum already due to the economic conditions. Immediately the private sector will cry foul by increasing their costs but they too will receive some great benefits. 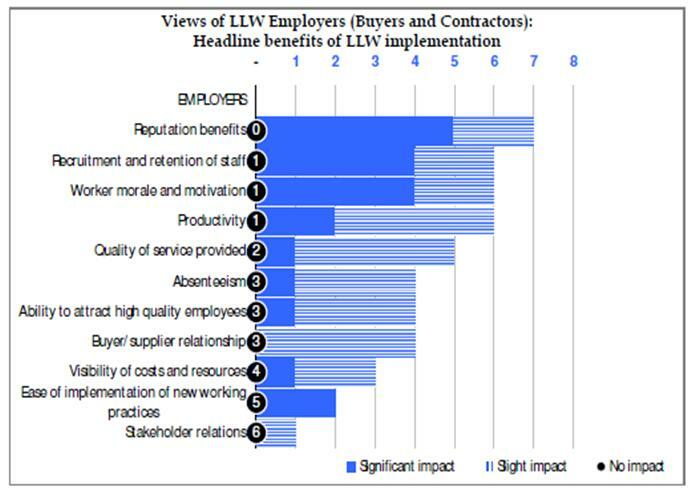 The report “An independent study of the business benefits of implementing a Living Wage policy in London” by London Economics identifies the following benefits to private sector employers embracing the living wage (See the chart above). The most significant impact noted was recruitment and retention, improved worker morale, motivation, productivity and reputational impacts of being an ethical employer. In practical terms an argument often rolled out by those that don’t subscribe to my thinking is the use of the EU procurement rules. All too often we hear the likes of Boris Johnson and other Tories saying this illegal under EU rules. This the usual Tory rubbish; social considerations are perfectly permissible and as long as the tendering process is transparent and equal then the use of social criteria in assessing tenders should be no different to any other criteria used. For those suppliers and contractors thinking of paying lip service to the requirement to pay the living wage, then we should look to the help of our partners in the trade unions to assist in monitoring and feeding back information to Authorities. Those same Authorities should look to include termination and damage clauses in their terms and conditions to enable claw back for suppliers found to be breaching their commitments. By implementing the living wage for these low paid workers it may also help retail SME’s in the local economy thereby assisting in trying to reverse the trend of declining high street shopping. Think of it another way, the Living wage could reduce or eliminate some of the effects of the bedroom tax. I would also argue that higher wages for low paid workers would benefit the economy as a whole by increasing the tax take and reducing the benefits bill. This would then truly be VFM on a social measure and improve the mobility and living conditions for many Scots and reduce the burden to Local Authorities. Finally, a further radical thought. 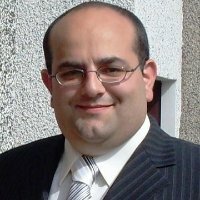 By adopting a more social agenda for change and assessing VFM in a truly social context this would help Scottish Labour demonstrate to the electorate that even though we are not in central government we are still making a difference to their lives and that we could even more if we were elected to govern at Holyrood and Westminster in the future. Why then do so many traditional Labour voters for Westminster swop to the SNP for Holyrood? We need to understand why they do this? what are the drivers? What is the rationale? note: We do not assume all SNP voters will vote YES in the referendum (because they are at core tactical Labour voters). However we should not assume that all Labour voters will vote NO either.